In March we are planning a performance of what is considered one of Sir James MacMillan’s greatest achievements: Seven Last Words from the cross, accompanied by a string orchestra. This will be complemented by a Bach cantata. Widely admired as one of MacMillan’s finest achievements, his Seven Last Words from the Cross is an absorbing and moving experience in concert, for performers and audience alike. The cantata sets the seven last sentences uttered by Christ on the cross, meditating on each to form a dramatic and emotional sequence. 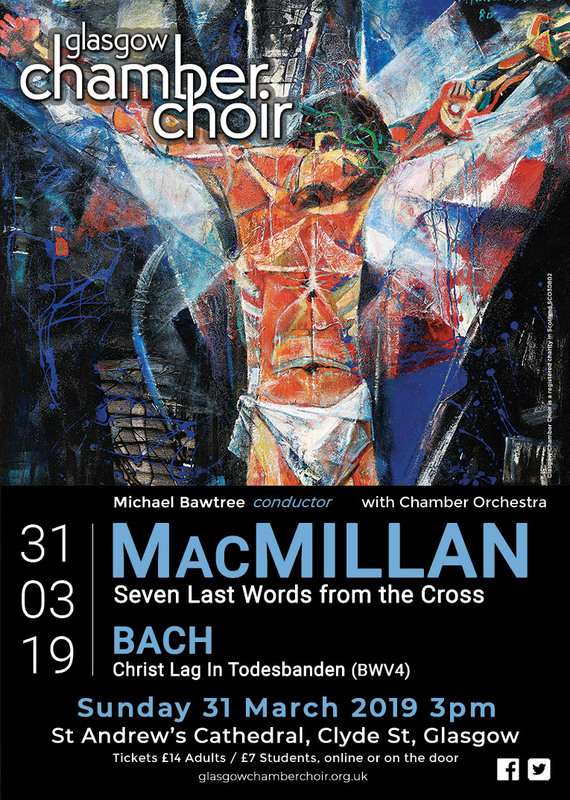 The MacMillan is paired with JS Bach’s Easter cantata Christ lag in Todesbanden. Both pieces are accompanied by strings. Bach’s cantata Christ lag in Todesbanen (Christ lay in the snares of death) is one of his earliest church cantatas, based on Martin Luther’s hymn of the same name, the main hymn for Easter in the Lutheran church. Each section of the cantata is based on the same chorale theme, and there are a mixture of solo and choral sections.